The nature is left almost half in Kamiakizu area, agricultural land is about 30 %, and the green takes up about 80% of the land. Cherry blossoms in spring, new green leaves in summer, colored leaves in autumn, plum flowers in winter, the nature colored the land in the season and it adds spice to the daily life. Moreover, there are some beauty spots and historical sites in the area. The huge rock and the group of strange shaped rocks are one of the spots and it registered as Yoshino Kumano National Park. People visit here for enjoying hiking in the mountains such as Mt. 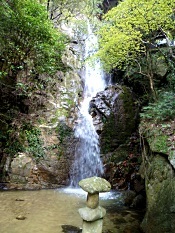 Takao, Mt. Ruizen-san, and Mt. Mitsuboshi-yama or touring historical spots like Kizekkyo throughout a year. Kamiakizu with lots of nature left holds various events in a year. For example, event for climbing up Mt. Takao which locals usually hiked in when they were in elementary school or junior high school is one them. The festival of celebrating harvest in fall is also popular among the area and some visitors also stop by. In addition, by taking advantage of characteristic regional resources, hands-on experiences such as mikan picking are taking place, and there are deepen exchanges with people in and out of the country. Mt. Takao had had baldness shaped like the Chinese character ‘human’ (人) on the part of the slope for a long time due to the landslide of great flood damage in Meiji era. It was not only a symbol of Mt. Takao but also a caution of a disaster for the people. ‘Thinking about Kamiakizu Association’ started to light up Hito-moji, the Chinese character of human, on the slope of Mt. Takao to revive that baldness for each week of O-bon season and New Year season, and now it becomes a seasonable tradition in Kinan area. In addition, Matsutake mushroom on Mt. 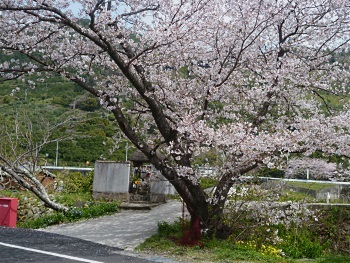 Takao is famous, and before fall harvesting area is measured off and done a public tender. It is unsure that which plat is well-harvest each year, so it becomes hot topic in the season and entertains residents. Putting rich nature and agriculture to use, the revitalization of the community is processing by the residents. As a part of that, Akizno Farmers’ Market Kitera was established in 1999 and Akizuno Garten, the facility connecting urban and agricultural village, was established in 2008. Around Kamiakizu, it used to be called Akizuno (before the war). Kamiakizu is used to be called Akizuno. The area is from the beauty spot, Kizekkyo on the north of Mt. Takao, the symbol of Tanabe, to Aizu-gawa river basin and the foot of the mountain, and the country has an old history. On the western of Mt.Takao, there are Mt. Ryuden-san and Mt. Mitsuboshi-yama with deeply green appearances across Aizu-gawa river. Kamiakizu is colored by some old traditions and stories, and people still live with nature in the country. In Heiancyo era, Mr. Fujiwara was the lord of a manor in this area, and Senko-ji temple was built in the middle of Mt. Takao. It is said that the temple was burned down, but at the ruins, three valuable sutra mounds were excavated. Evacuated artifacts such as bronze mirrors and sutra cases are kept and exhibited in history museum in Tanabe and in Tokyo National Museum. Why is it called ‘Akizuno’? People used to call ‘Akizuno’ for around Kamiakizu area before the war. Now there isn’t Akizuno for a place name, but Akizuno-bashi Bridge exists. People forgot about the name, Akizuno, by the time. At the time of rebuilding Kamiakizu junior high school, PTA of that time revived the name of Akizuno as a title of the public relations magazine. And in 1994, Akizuno-juku, the association of reginal construction organized by 24 regional groups, was established and people started to use the name, Akizuno, again. In 1998, the name of the facility connecting urban and agriculture village that residents established on the site of elementary school was decided to ‘Akizuno Garten’, and so its name is left.